The captain stood out yet again for the Blues as they climbed back to the top of the table with a narrow win over the determined Highlanders. For a match that was threatening to head to a draw, it was Sunil Chhetri who decided that a draw was not enough for his team. His goal just after half time ensured that the Blues celebrated the Indian Republic Day by returning to the top of the ISL table. The towering custodian was in his element as he kept the visitors at bay with some fine saves, including one where he flung himself across the goal to deny former Blue Seiminlen a goal. The energetic full back had a torrid time against Danilo Lopes on the right wing and was beaten for pace on more than one occasion. Grew into the game in the second half and it was his teasing cross into the NEUFC box that led to the winning goal. Was unlucky with being penalised for the hand ball that led to the NEUFC goal. Put in an assured shift yet again proving to Roca that he is a vital cog of his plans for the team. The midfielder kept it simple in the middle of the park provided a good screen for his defence. 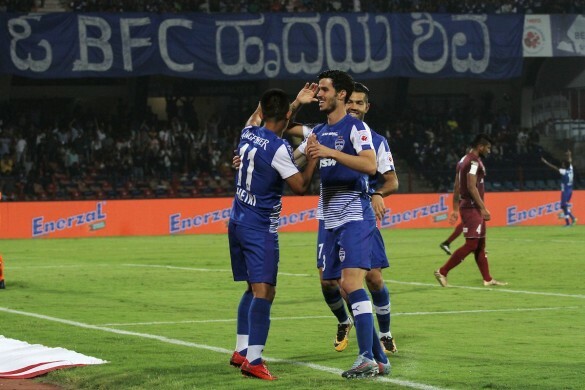 The speedy winger had a quiet game by his standards, but there was no shortage of his energy on the vital Bengaluru right flank along with Khabra. Hauled off for Boithang at the hour mark as Roca had an eye on the AFC Cup game on Tuesday. 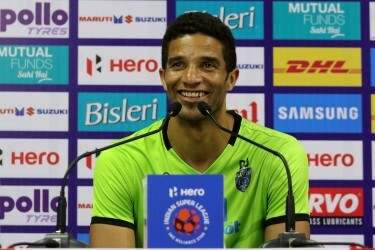 The Blues would be thankful for the day they decided to convince India's Captain Fantastic to join the club as it was his impressive finish from a tight angle that brought home the 3 points for Roca's side. Brought on for Udanta Singh just at the hour mark and ensured that his team did not lose possession and kept things tight at the back. The goalkeeper could not do anything about the quality of the 2 Bengaluru goals in an otherwise steady performance. Avram Grant now has a selection headache thanks to Chettri's 4th yellow card that has ensured that he won't be a part of the next game for the team. Struggled to track the runs of the other Chhetri in the Blues lineup. A muted performance by the defender, but Grant would be impressed by the composure that the defender showed despite the siege laid to the NEUFC goal by the home side. The NEUFC fan favourite was a threat to the home side along with Seimlinen and their drive would have impressed Grant considering this was a tough away fixture. Dropped into dangerous pockets of space in front of the Bengaluru defence and tried to pick out spaces for the full backs to run into. The former Blues man tested Gurpreet with a rasping drive that threatened to hit the top corner. Always looked dangerous when on the ball and was the lynchpin of the NEUFC midfield. Expect to see more such performances from the medio. The defensive rock was not short of effort in the middle of the park, but was often bypassed by a fluid Bengaluru midfield. Grant would however be impressed by this performance and will only see more improvements from the Indian international.